This article first appeared in the Feinberg Research Office’s Breakthroughs Newsletter. Xinkun Wang, PhD, director of the NUSeq Core Facility at the Center for Genetic Medicine. Xinkun Wang, PhD, serves as director of the NUSeq Core Facility, where he supports the research of scientists throughout the medical school with the latest genomic technologies, including next-generation sequencing. Along with his leadership role at the Core, he is also an investigator, with a personal research focus on neurodegenerative diseases, especially Alzheimer’s Disease. 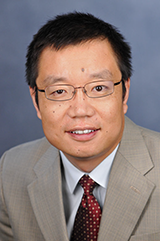 Wang, also a research associate professor of Biochemistry and Molecular Genetics, joined Northwestern in the fall of 2015. As director of the NUSeq Core Facility, my research and technological interests are in the implementation of state-of-the-art genome technologies to unravel the complexity of biological systems. Life science research and biomedical practice are becoming increasingly driven by high-throughput DNA technologies that enable us to examine the entire blueprint of life. Next-generation sequencing (NGS) has the most profound impact among these technologies so far, and it is the major technology driving precision medicine. Since its first appearance a decade ago, NGS has generated oceans of data that collectively challenge even the most advanced computer system available. Besides implementing NGS and other genome technologies, my interest is also in extracting biological knowledge from genome data to contribute to the understanding of biological systems and human diseases. Specifically, my research interest over the last decade is in neurogenomics, i.e., applying NGS and other technologies to study the human brain in terms of how brain gene networks change in the aging process, and how that change might underlie the development of degenerative diseases such as Alzheimer’s disease. What is the ultimate goal of the NUSeq Core? My goal as director is to grow NUSeq into a state-of-the-art research facility that brings world-class genome research infrastructure to Northwestern investigators, and thereby support the mission of producing innovative, pioneering research as a leading university. The ultimate goal of NUSeq is to serve as a launchpad to catapult Northwestern into an international leader in genome research and technology development. Since its establishment less than two years ago, NUSeq has quickly grown into a major provider of genomics technologies to investigators at Northwestern and other institutions in the Chicago area, as well as across the country. We actively pursue the most recent and emerging technologies to ensure the investigators we support have the best technology possible. How does NUSeq Core advance medical science and knowledge? The medical field is moving in the direction of personalized and preventive medicine. NGS and sequencing data mining play a central role in this endeavor. Situated at the technology forefront of genome sequencing, including data analysis, NUSeq advances medical science by providing expert support and high-end instrumentation to genetic/genomic research conducted at the medical school, the university and other institutions. These advancements span the entire spectrum of medical research, from cancer, cardiovascular disease, diabetes, infectious diseases, to neurodegenerative diseases. NUSeq is largely funded through cost recovery from technologies we provide to research groups who are supported by external funds, such as those from the National Institutes of Health. Institutional support is also essential for NUSeq’s operation. This comes from the Center for Genetic Medicine, the medical school and Northwestern’s Office for Research. Moreover, philanthropic donations are an integral part of our support system, as acquiring, maintaining and updating high-end genome research instrumentation requires heavy investment and a multifaceted funding model. Who makes up your research team and what role does each individual play in your research? NUSeq has two major components: data production and bioinformatics. Data production is conducted by a group of highly skilled, committed genome technology specialists: Alan Aalsburg, Ibrahim Musaitif, Kara Pivarski and Shuangni Yang. Bioinformatics is carried out by Matthew Schipma, PhD, associate director of NUSeq, and Ryan Embry, who are experienced informaticians with a great understanding of biology. In addition, Ashley Limón handles finance, researcher/vendor communications and team logistics. Undergraduate and graduate students are also part of the team as interns or part-time employees. This summer, we have two Northwestern undergraduate interns, Keldon Lin and Kevin Yu. What resources at Northwestern have been helpful for NUSeq? NUSeq relies on resources provided by multiple units inside Northwestern. NUSeq was established by the Center for Genetic Medicine under the directorship of Elizabeth McNally, MD, PhD. The Center for Genetic Medicine provides account management, personnel hiring and communications support for the Core. Feinberg’s Research Core Planning Office, directed by Jeff Weiss, PhD, provides operation subsidies and support on multiple fronts. The University’s Office for Research Core Facilities Administration, under the leadership of Phil Hockberger, PhD, and Andrew Ott, has provided internal resources for equipment acquisition, organized core manager group mentoring and the core management certificate program. Last but not least, the Robert H. Lurie Comprehensive Cancer Center of Northwestern University provides access to the Center’s OncoSET Precision Medicine Program, which is a great resource for NUSeq to obtain CLIA (Clinical Laboratory Improvement Amendments) accreditation for clinical sequencing in the future.